What is the best beer for a cold winter night? Even big sweet wintery beers should be brewed to have some balance, something many brewers seem to have forgotten. While I enjoy some barleywines, wee heavies, and doppelbocks all too often they are sticky sweet (especially after a year or two once the hops age out). Imperial stouts have an advantage over these other big beers, while their high hopping rate balances the residual sweetness early on the roasted edge from the grains assists as the beer ages. The polyphenols contributed by the dark grains also help fight oxidation, allowing big stouts age more gracefully than their pale counterparts. I had a hard time making that my answer (it seems too obvious), but I've got a two year old case of Bell's Expedition Stout in my basement (and it's the only case I've purchased in about four years). Belgian strong darks are the other strong contender for my cold weather drinking dollars. Rather than being balanced by hops or roast the best ones are fairly well attenuated (something brewers of other strong ales should take note of). Dark sours have a similar "problem" I enjoy drinking them year round, so I don't view them as a special winter only treat. To me a wintery beer should feel rich and substantial, a higher final gravity enhances that character. I enjoy the rest of the styles listed, but either they aren't wintery enough (smoked beer, DIPA, old ale), or they aren't my favorites (barrel-aged beers tend to be too boozy, holiday ales are frequently over-spiced). Even the best examples of each of those just don't say winter like top shelf imperial stouts (although I guess barrel aged Imperial Stouts can as well...). What says "winter" to you about the beer style you picked? Were you thinking of a specific beer/batch or the style in general? Did I leave out your favorite winter beer style? Post a comment and let the rest of us know what you were thinking. 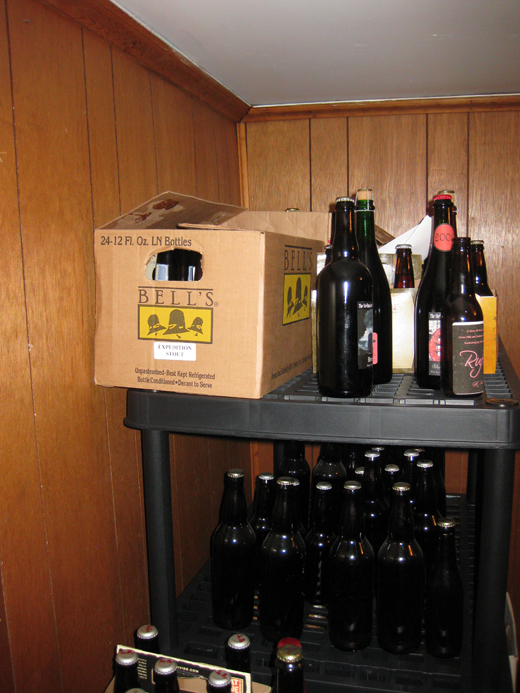 Last week I finally had a chance to bottle my Smoked Baltic Rye Porter, and Sour Cherry Quad which should make for some good cold weather sipping in a month or two. My Biere de Garde on tap is just about carbed, which should be a good beer for the holiday season. I'm hoping to get a couple batches brewed in the next few weeks before the holidays arrive (although the starter of WY2001 I started last night hasn't taken off yet). The December poll is up on the blog, "What is the toughest type of beer to brew?" In winter, I find something nostalgic about pale lagers. Cold weather and lagers seem so natural. Probably because I'm thinking of Scandinavia; where light ice-cold viking lagers are so prevalent. Besides that I really do not care for light lagers. I certainly don't mind a imperial stout or barley wine most days, not necessarily just winter. Coincidentally my first Imperial stout (mugwort, spearmint, Hungarian high toast oak, and whiskey, infused) will be ready to bottle in a few weeks. Interesting result btw, I thought more people would be with the "something light", option. Bells Expedition is one of the best beers for aging. I won't even drink one with less than a years worth of age on it and I have 5+ year old bottles that are divine. I have had 10 year old bottles and it didn't taste much different than a 2-3 year old version. When the days get Dark and cold your beers have to follow I fully agree with a winter stout. But any dark beer will do living in Australia I opened a dark ale today in 31 Degree Celsius weather and the whole bottle regretted I wasn't in a cabin in the depths of winter sipping it. I have the same problem, sometimes in the summer I get a craving for something dark/strong. Then have trouble finishing it.